Alphabet Photography Project: L is for Light… | Phil – Refuelled! …And, particularly, the light emitting diode, or LED, the marvel that is causing a revolution in all kinds of lighting. Homes, offices, shops, factories, car parks and many more situations are benefiting from the long life and amazing energy savings that this technology brings. Although commercial use of electro-luminescence is not new, The white LED as we know it has only been around for around twenty years – and was prohibitively expensive, to begin with. 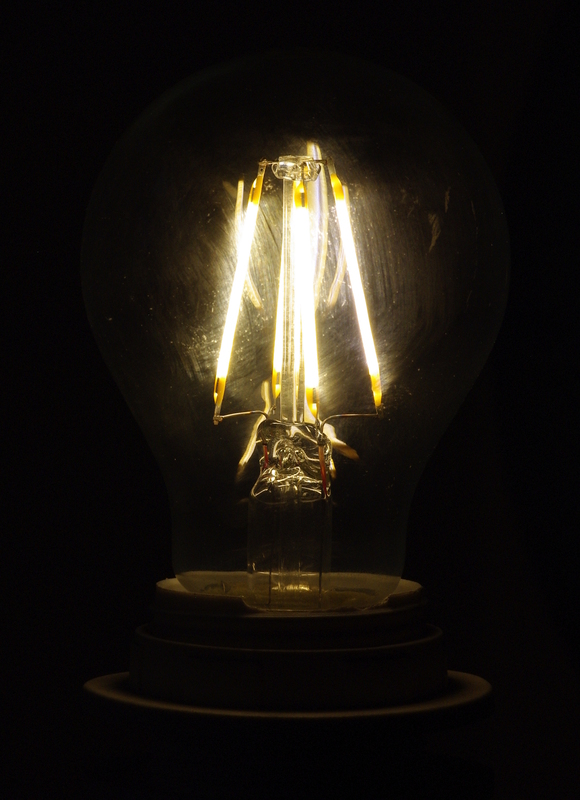 The LED lamp in this picture is of the so-called ‘LED filament’ type, and at first glance resembles the first electric lamps made by Joseph Swan and Thomas Edison. The background looks black because the exposure has been optimised for clear portrayal of the LED filaments inside the outer bulb. In use, however, when inside a shade, it’s hard to tell the difference, in terms of light quality and colour appearance, between these lamps and traditional tungsten lamps – but they use around 10% of the energy! Oh, and another key feature: at switch-on, full output from an LED lamp is virtually instant, in contrast with some types of fluorescent lamp, which leave you in the gloom for around a minute after starting, giving you plenty of opportunity to trip over some discarded toys, or whatever! Mr Swan’s invention has done us well, for almost 140 years. Now, it’s time to move on.